1. What is the Payment Form Builder? The Payment Form Builder is a drag and drop Form Layout Builder. Rearrange fields within a section. Change the field label and help text. 2. Where do I find the Payment Form Builder? From the Payment Forms Tab. Click into the Payment Form you wish to edit. 3. 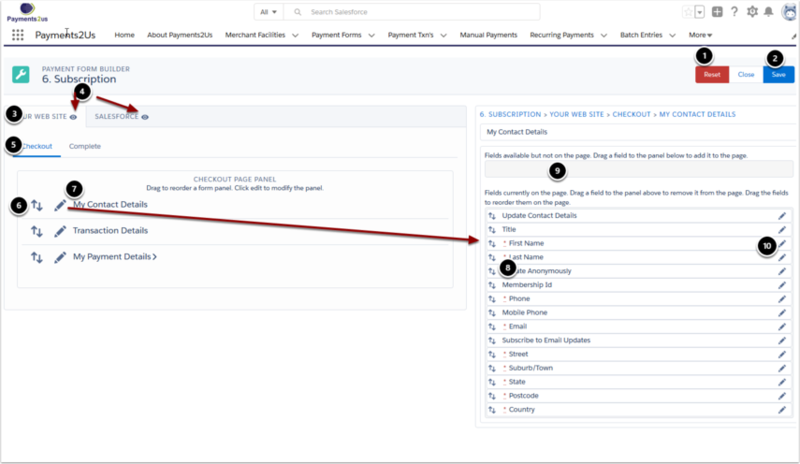 What that the components of the Payment Form Builder? Reset button resets the form to its default. The default is based of details on the Payment Form and FieldSets on the Payment Txn object. You may need to press the Reset button if you make changes on the Payment Form, such adding custom sections. The "Your Web Site" tab is for the form layout for public facing forms. The "Salesforce" tab is for internal Salesforce users views of the form. This enables you to say have an Email address required on your public website, but optional for internal users. The "eye" icons provide a preview of the form. Click on the Up/down arrows to move the entire sections up or down. Drag fields to this section to remove them form the form. Alternatively drag fields from this section back onto the form. Press the Pencil Icon to update field details such as label, help text and if required or not. NOTE: If you wish to add custom fields, you first need to add them to the Fieldsets on the Payment Txn object. Please see the Adding Custom Fields to your webform user guide.